IE -6AN Coolant Adapter Fitting. Red anodize. IE Press in -10an valve cover breather. Red anodize. IE 2.0T TSI SAI Block Off Plate. Red anodize. Billet Aluminum 1.8T SAI Blockoff Plate. Red Anodized. Rear Breather Blockoff Plate for 2.0T FSI/TSI Engines. Red anodize. VW 16V Idle Valve Blockoff plate. Red anodize. 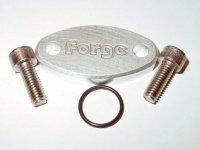 Integrated Engineering 1.8T Catch Can Return Adapter. Raw finish. 1.8T Breather kit for Valve cover and block. Red anodize. IE 2.7T 30V V6 SAI Blockoff Plate Kit. Red anodize.